This year my world became very small and almost too insular. There were times when I thought that I needed to step out more, return more phone calls and text messages, or show up to more events. We've almost been conditioned to think that to live a fulfilling life we need to do more, travel more, show up at the bar more, eat more, talk more, post more. We've become obsessed with the more, but have mistaken it for the Big that we have the potential to grasp. I am hoping that this year, my little life can expand to its limits and fill up with the small pieces that leave me full of love, happiness, and the other mushy things that Oprah and my childhood Sunday School classes promised. I resolve to live a Big small life. I resolve to stick out my tongue in the rain, pinch the dirt in between my fingers, kick the sand with my toes, and lick the frosting off of more cupcakes in 2013. I resolve to spend less money on clothes and more on walking shoes that will get me somewhere. I resolve to eating a peanut butter and banana sandwich at my desk and saving the pennies for a trip. I resolve to handwrite and mail one letter to a friend living in a different city. I resolve to cook one meal by my mother's side. I will read the instructions from the cookbooks and watch her ignore them. I resolve to visit a new state; maybe Texas, maybe California. Anywhere, really, that can relieve me of my Northeast snobbery. I am thinking Austin. Yes. Texas and BBQ. I resolve to bake a chocolate cake from scratch with peanut butter frosting. I resolve to attend a concert. I resolve to eat escargot again. I resolve to read for thirty minutes everyday. On most days. Magazines will count. I resolve to take more pictures of everyday objects that make me happy without the pressure to post them on some social networking site. I will remember to see the beauty. I resolve to believe in my vision at work and in my work. Experience through play is the best way to teach, and I will continue to move in a direction that trusts that in joy we can learn. I resolve to do something that is really really difficult. I resolve to forgive myself for not being able to do it perfectly. I resolve to spend a night in a hotel room in Boston. Drink wine. Eat	cheese. Watch TV underneath the covers. I resolve to take a drawing class not to become a master, but to try something that I never thought I could do. I resolve to listen to more Nina Simone on Saturday mornings. I resolve to clean more. 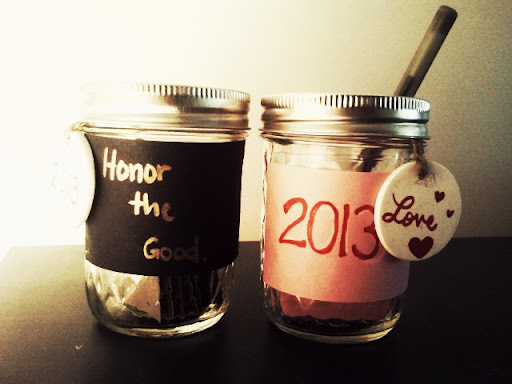 I resolve to honor the good in a jar. On my dresser, beside the nail polish and jewelry dish, will be a space to write down on small pieces of paper all of the happy moments, the funny jokes, the acts of kindness, and the simple reminders of humanity. On the hardest of days, I will pick one out and smile at the possibilities of the goodness that exists. I resolve to find love, and not in a pet cat either. Real romantic love. I am putting my wishes in a jar for that, too. I resolve to love Baby Tessa. @Brown-Eyed Girl I will let you know when I go out there!